Sleep is like walking when you’ve been running all day. Do you wake up tired or with a headache? You may think sleeping is simply a welcome respite- a time when everything shuts down. Not true. Your body never completely relaxes. Even when your eyes are closed, it continues to work (but not as hard). What happens if your body never gets the chance to take the break it deserves when night falls and your brain tells you it is time to rest? Do you snore? Do you wake up tired or with a headache? Do you have trouble concentrating? If you answered yes to the above questions you’re probably not getting a good night’s sleep. Your body is not able to rest. Snoring and daytime tiredness are a clear indication of a more severe disease called Obstructive Sleep Apnea (OSA). If you suffer from OSA, when you sleep your airway loses its strength (its patency) and collapses in on itself. The narrowed or completely closed airway doesn’t let enough oxygen into your body. When you have OSA, your body is never walking. It’s always running. 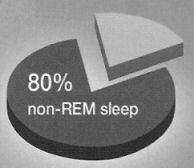 The majority of your night is spent in non-REM sleep stages. Here, your blood pressure and heart rate drop to levels much lower than when you are awake. This is your body’s chance for some relaxation. Normal physiological changes occur when daylight wakes you up. Your heart begins pumping and working harder. Gradually your heart rate and blood pressure climb. If you are not sleeping well, your body never relaxes. It works hard at night and even harder during the day. Continuous Positive Air Pressure (CPAP), surgery, or Sleep Disorders Dentistry. CPAP is a mask that fits directly over the nose and mouth and is worn during the night. The patient lays on his or her back so as not to disturb the position of the mask. Pumping air into the nasal passages and into the lungs, it works much like a reverse vacuum cleaner. Side effects may include dry mouth and bloated stomach, lacerations on the bridge of the nose, and sleep deprivation. Surgery ranges from tonsillectomy to tongue-base surgery and encompasses everything in between. Degrees of invasiveness vary from procedure to procedure. Some are more painful, some have longer recuperation periods. Estimates of surgeries’ effectiveness are as high as 50% and as low as 30%. Sleep disorders dentistry is an emerging field of dentistry concentrating on the reduction of patient’s respiratory distress resulting from sleep disordered breathing—i.e. snoring and sleep apnea. We use airway orthotics (oral appliances) instead of the cumbersome CPAP or ineffective surgery. An oral appliance looks much like an athletic mouth guard, but not as thick. Airway Orthotics (AO) come in varied designs and may are FDA approved. They are non-invasive and must only be worn at night. In order to fit the oral appliance correctly, we perform two quick and completely painless tests: rhinometry and pharyngometry. Via the Eccovision, a suite of diagnostic equipment emplying “acoustic reflection” technology, the two tools map the nasal and Pharyngeal airways, respectively, producing scans pinpointing their trouble spots. Those who suffer from OSA experience repeated awakenings during the course of sleep. During sleep, the airway relaxes, losing its patency (muscle tone) and narrows or closes completely. Oxygen is depleted. After 10 to 20 seconds (a minute is not unusual) the body forces the person awake so that it can open the airway again. Often, these interruptions are so short that they go unnoticed but can occur quite frequently- hundreds of times per night. The drop in oxygen levels caused by not breathing and the increase in heart rate and blood pressure due to frequent awakenings puts stress on the heart. The result? A rise in blood pressure during the night and a resulting rise in blood pressure during the day. Permanently. Are you currently taking hypertension medication? Lowering your blood pressure may be difficult if your sleep apnea remains untreated. Correcting your sleep apnea problem will likely lessen the severity of your hypertension. CAD results from constricted arteries or atherosclerosis (the build up of fatty material and plaque). OSA causes a drop in blood oxygen levels and a rise in heart rate and blood pressure. As a result, the heart is forced to work harder. Simultaneously, the heart needs more oxygen due to the OSA and the arteries are narrowed due to the CAD. Ischemia, lack of blood flow, occurs. The heart responds, trying to pump more blood through the smaller area straining the heart to such a degree that a heart attack could results. A stroke occurs when the supply of blood and oxygen to the brain is either partially or completely cut off. In a person with OSA, blood flow and oxygen is already reduced, further exacerbating the likelihood of a stroke.